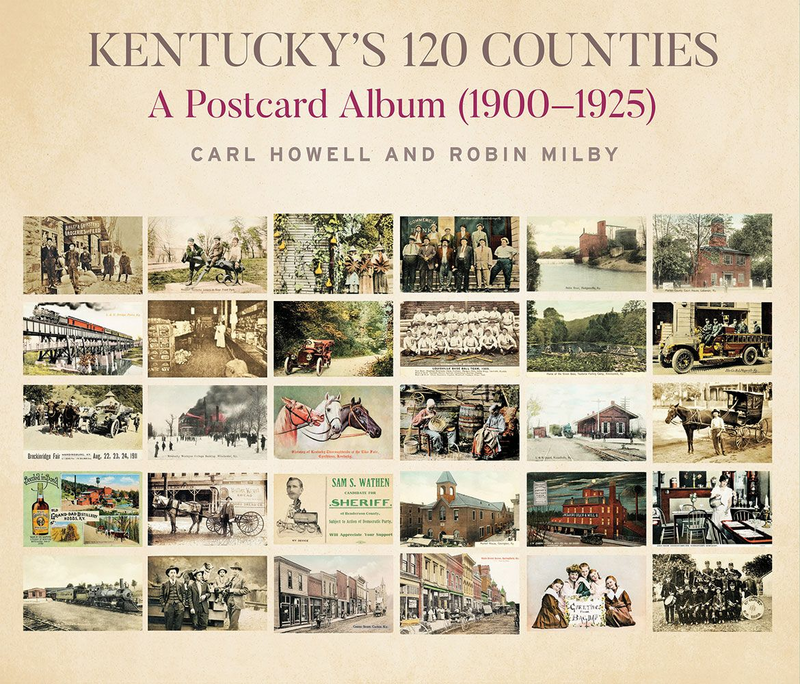 Kentucky's 120 Counties: A Postcard Album (1900�1925) gives viewers a front-row seat into the past that enables them to see, for the first time, people, places, and events during a remarkable period in the state's history. Patrons purchased postcards at local drugstores, dry goods establishments, and country stores to catch a glimpse of their hometowns in postcard format. Postcards also portrayed neighboring communities, rural scenes, and people engaging in both work and play. In a time before photojournalism, postcards provided something that newspapers of the time could not; postcards put a face on the news and on the world itself. A 1908 postcard of William Jennings Bryan speaking in Lebanon, Kentucky, sold like hotcakes. In Leitchfield, a local photographer took his camera to the Grayson County Fair and leaned over the rail to capture an electrifying image of a jockey on his horse, barreling down the track with a whip between his teeth. Such spectacular moments and glimpses of everyday life form the heart of this book. Some images provide the only visual records of early communities and their railroad depots, grist mills, country stores, and churches. Other photos depict anglers fishing for "green bass" in Kinniconick, grandiose hotels erected beside rural springs, a man hunting quail in Salem, and converts being baptized in the flood waters of the Ohio River. This book is a panoramic view of the Bluegrass State and America in the early 1900s. Look into the lives and the eyes of the people, and you might just see your own hopes, dreams, failures, and successes come into focus. "Kentucky has a lot of counties — with 120, it ranks third in the nation. Since there were no restrictions on the size or population of those entities until the 1891 constitution, the counties mushroomed — from Kentucky County, Virginia, in 1776, to nine counties by statehood in 1792, to a hundred 60 years later. … That history makes Kentucky's 120 Counties: A Postcard Album (1900�1925) even more significant. The over 1,300 images, many of which are one of a kind and all of them interesting, tell the story of each county in a particular moment in time, just before the transition era of the New Deal. … Carl Howell and Robin Milby have compiled a landmark resource that is both visually impressive and historically important. They do full justice to the heart and soul of Kentucky — its counties." 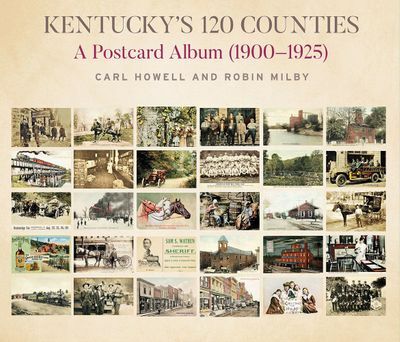 Carl Howell is nationally known as Kentucky's premier vintage postcard collector. For many years, he contributed articles and postcard images to Kentucky Explorer magazine. He has co-authored three Kentucky county history books illustrated by his extensive postcard collection. His other works include Lincoln's Kentucky Years and Kentucky in the Early 1900s. Howell is a Lincoln historian and archivist and a frequent speaker at historical events and area club meetings. He served on the advisory board of the Abraham Lincoln Bicentennial Commission and is president of Preservation of Lincoln's Kentucky Heritage, Inc.
After a stint as an FBI special agent in the late 1960s, Howell returned to his hometown of Hodgenville, Kentucky, and began practicing law. He retired in 2014. He currently lives with his wife, Sharon, in Hodgenville, Kentucky. Robin Milby is a passionate collector of vintage postcards. He also buys and sells antiques and collectibles, specializing in political memorabilia. Milby was sports editor and a columnist for the LaRue County Herald News from 1984 to 1991, where he won several awards in photography and writing from the Kentucky Press Association. Milby retired from Dow Chemical in 2018. He has been a board member of the Southern Gospel Music School of America in Chattanooga, Tennessee, and currently serves on the board of the LaRue County Public Library. He and his wife, Kathy, have three daughters.